I want to write many thing but where do I start. Ok let me put them in the chronological order! I was to board the bus from Bangalore to Coimbatore. Due to the heavy pour in the evening buses arrived late. Until then it was supposed to be a boring 60 minutes standing there. But then I noted the things around me and entertained myself. First thing I found mobile phone users. For every 10 person standing there 4 of them are talking in their mobiles. Talking with, their loved once, some engineers still helping & directing their colleges to fix bugs, some call their parents and inform their safe arrival to the bus stand and their arrival time to their home town and some even call random friends and have a talk with them to pass time. Next time try to observe people. :) Its fun. A most memorable day for us! We graduated on this day! We were declared as degree holders and took a pledge. I would never feel like saying our days in Tech soil are over. Its just a change in designation from Student to Alumnus. The Vice Chairman of Cognizant preceded over the function. Photos uploading delayed. My feed reader said, Microsoft Surface has been announced. With the usual inquisitiveness I opened a new tab. 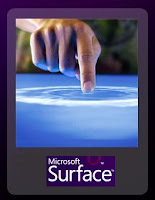 Once I went to all the presentations and navigated the site, I would say Microsoft Surface has taken users beyond their expectations. Its awesome. Do check out and find more. Yet another fancy stuff from Redmond after Photosynth is this. Yet another designation change! New challenges, new crew! This post will definitely help fellow Bloggers to enhance their blogging experience and might motivate new bloggers! Long since I have kept track of many Google's beta. Once such was this "Google Analytics". Analytics is a free service offered by Google that generates detailed statistics about the visitors to a website. Its main highlight is that a webmaster can optimize their AdWords advertisement and marketing campaigns through the use of Google Analytics's analysis of where the visitors came from, how long they stayed on the website and their geographical position. Today my older interface was automatically migrated to new Ajax rich interface. That I fell in love with immediately. You get what you need. Thought I don host a commercial website, the figures that are displayed make me understand about the visitor who visit my blog. Some new features that caught my eye was Ajax rich User experience. The graphs and dimensional summary I get regarding my blog. My favorite of the all is the export as pdf option. For the report I give a perfect 10. Of late I was googling of how to upload files in blogger. The first link said bloggers disallow uploading files for security reason. But I din want to use third party servers to host my file. Finally with a little scratch of my head I found a method and uploaded my pdf report here. I found this post on Universal search interesting. Here is my Feed Reader. All news & blogs are read using it. 0's & 1's - for some this might look as a familiar title, for some its strange. Yes today, I decided to write up what that actually surrounds us. In a warm up to this post, I asked few of my friends and colleagues as what surrounds them? One said "people", one said "system", one said "Nothing" :) and even one said, "anna... Heavy lunch... Thookam na...". So people have different view to it. Even some strange on me, when I asked them this question. But my view was different. I realize and see 0's and 1's surrounding us. My ethereal tracker said 95 packets crossed in and out of my Ethernet with my system in idle state. So everything are composed of 0's & 1's. For every Phone call we receive, Every mail we do, every song we listen its composed of 0's & 1's. So we haven't realized the importance of them. Now the question is are there sufficient 0's & 1's to satisfy our need? The present says yes, but the future? Let me take up one small area the amount of 0's & 1's we consume daily. On an average a Software Engineer nerd, would go about consuming the following ways. So, I consider me as a test subject. I send up to 5-10 personal emails a day, it reaches around 30 recipients. I randomly chose a mail and found it had 382 characters, so its totally 8(mails) * 30(recipients) * 382(char) = 91680(chars). So its almost 91kb of data. Some increase exponentially as mail threads increase. I can recollect my class discussions going up to 80-90 replies. I atleast post a blog weekly. I get news alerts, my rss feeds, orkut scraps/communities Chat conversations I make, I lines of code (obviously less) and many more. So on an average an individual consumes/produces around 10-15mb of digital data. Now consider the average number of internet users. Billions! So think of the Digital data thats produces every second, its stagerring. Will there be resources to sustain it. We hope we have. Now what if these resources get depleted one day! Is "The Matrix" a reality. yes of course, if we move at this pace. We might be ruled by others. Just because data and computation has increased around us. Research say, the average temperature would increase by 10 degree by 2080, some large ice caps melt and increase sea level. Where are we heading too? Interesting links are bookmarked in "Useful Scribbles" section at the right. In the verge of beginning my professional career. Yesterday we had a trip to Nandi Hills, 60Kms from Bangalore. Morning mist was good, the roads were good. For all Bikers of Bangalore, its the first place to try out. We had the usual fun. It was interesting too. Also we managed food to be backed from my class girls house, only during lunch time we realized instead we could have gently starved. LoL :) Keeping it short, slide show tell you more!